hen visiting night markets or food areas around Thailand, you will often see vendors with a myriad of colourful sweet treats on display. Common questions from international guests to Thailand are along the lines of “what are they all” or “how and what do I order”. Our very own ‘foodie on the street’, Leigh, strips away the veil on these Thai sweet favourites. 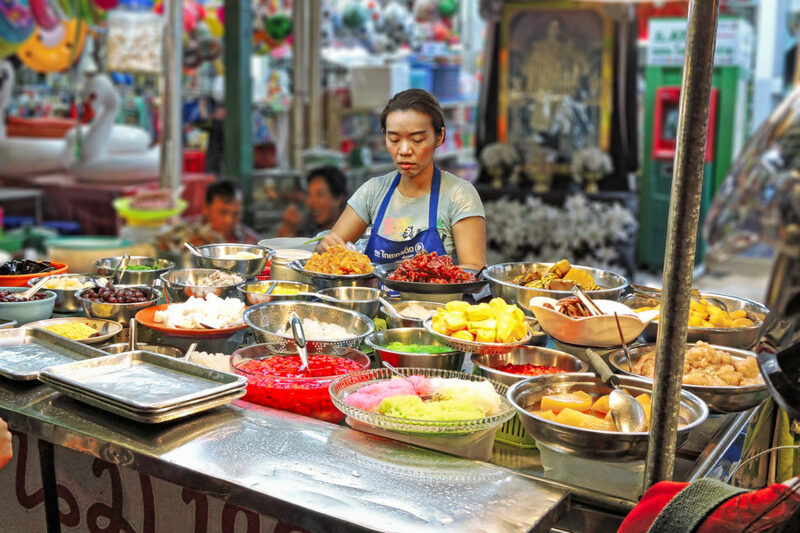 In Thailand, sweets are a major part of the food culture. From the morning to the evening, you will find different textures, flavours and types of sweets to tempt you. Sweets are eaten for breakfast, as a snack, or anytime during the day. They are also a great way to ease the sting of chilli in the mouth, as the sugar counters the chilli and the coconut milk acts as a soothing agent. 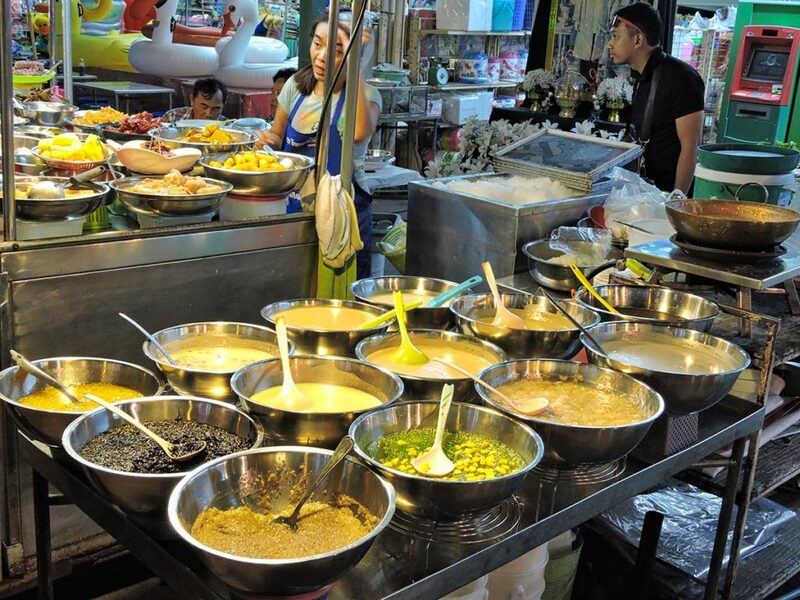 At night, you will find street vendors all across the kingdom serving up Naam Khaeng Sai – a shaved ice dessert, or Khanom Wan Ruam Mit – a dessert of mixed sweets. At these vendors, you will see a vast number of bowls with different colours, shapes and textures of sweets. For many, this is where it ends for them, as the choice looks too daunting: What are all these bits? Is it all really sweet? How do I order? How do I eat it? There are so many different sweets on offer and, contrary to what you would think, not everything is overly sweet. Sometimes Thai sweets can be quite deceptive, as some may look sickly sweet, but are not; hence why sugar syrup is added on request. Anything that looks candied is probably sweeter than say a jelly. There are usually two types of coconut milk on offer; the slightly sweeter one is for the multi-coloured sweets and jellies, whereas the other one is slightly saltier and added to things like black sticky rice or yellow beans. This adds a different flavour balance to the sweets. Most vendors normally have three zones of sweets on display. One zone is of fruits or jellies already mixed with coconut milk. One such dish is the very popular Gluay Buad Chee – Bananas in Coconut Milk. The second zone features the thick, sticky looking concoctions like black sticky rice or yellow beans in syrup. These are quite textural dishes and are usually served with the slightly saltier coconut milk. The last zone has the vast array of bowls displaying the multi-coloured sweets; selections like black jelly, pomegranate seeds and others or candied morsels like Chinese dates, pineapple and tomatoes. There are also other selections that are flavoured with pandanus along with things like sweetcorn kernels or jackfruit. There is so much to choose from; just ask for a little of whatever you are attracted to, as nothing is offensive to taste, with some being sweeter than others. You will usually see locals ordering their sweets to take away in bags, though the vendors will also have some small bowls and nearby tables, allowing you to sit and eat. You may be asked whether you want it served with Nam Khaeng - crushed ice, which is great on a hot night. They may also ask if you want Kathi - coconut milk and/or sugar syrup; it’s up to you, as these desserts are about personalising. If you are close to a 7/11, buy a small tub of your favourite ice cream to accompany, or just eat it as is. All selections are delicious and it’s a really inexpensive and refreshing way to eat sweets in Thailand. Eat like a local and try out the street vendors serving these sweets between Soi Hua Hin 56 & 58 on Phetkhasem Road, just in front of Tesco, and also on Naebherkardt Road at the corner of Hua Hin Soi 55/1. Thanks for making the dessert choices a little clearer, Leigh. I do as you describe and gaze at the fabulous colours and ingredients and wish I knew what to order, then get no further. Time to be a bit more intrepid and give them a go.